Seyfarth Shaw’s U.S. practice advises clients in practice areas including labor and employment, litigation, construction, corporate (including M&A, capital markets, venture and private equity), employee benefits and executive compensation, environmental, government contracts, intellectual property, real estate, trade secrets, trust and estates, and bankruptcy, among others. We represent clients of all sizes across all industries, providing excellent legal service, sophisticated technology and process improvement solutions and ongoing support to each client regardless of size, jurisdiction, industry or legal needs. Our clients range from Fortune 100 to midsize companies, and include publicly traded and privately held companies and various types of funds. The firm is a recognized leader for value and innovation in legal services, and our acclaimed SeyfarthLean® client service delivery model has earned us numerous accolades from a variety of highly respected third parties, including industry associations, consulting firms and media. 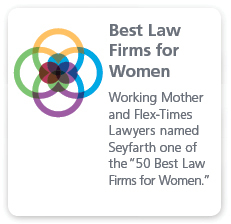 Seyfarth earned a top spot in the Financial Times North America Innovative Lawyers 2015 report of the most innovative firms, including top-ranking “standout” honors in the “Business of Law” category for SeyfarthLink, our next generation legal management platform. In August 2014, the firm was honored with the “Most Innovative Project of the Year” award from the International Legal Technology Association (ILTA) for our development of SeytMap, a sophisticated and interactive matter management tool that allows attorneys and project managers to fully operationalize, tailor and manage a process in an interactive environment. In addition, the firm was shortlisted for ILTA’s 2014 “Innovative Law Firm of the Year” award. The 2014 recognition follows on the heels of the firm’s 2013 ILTA awards for excellence in innovation and technology: the “Innovative Law Firm of the Year” and “Innovative Project of the Year” awards. 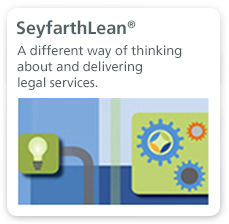 ILTA recognized Seyfarth for overall innovation and our use of custom technology to create a unique legal services management and client collaboration platform. 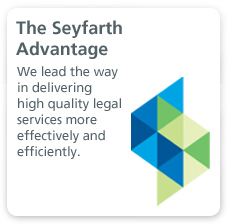 Seyfarth lauded for achievements in business law, crowdfunding and social responsibility.